Visit the official website of SUAT and click on the link 'Application Form'. Enter personal, academic and contact details and click on 'Save and Proceed'. Upload the scanned copy of recent photograph and signature. Click on Submit button. Pay the application fee and take a printout of it for further reference. Purchase the Application Form from the SUAT authorized campus office. Make the payment via demand draft or cash on the counter. Fill in the application form and paste a passport size photo in the box. Submit the application form on the counter. 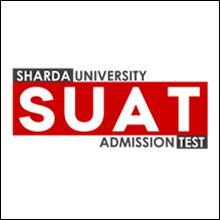 SUAT 2019 Application form will be available only on the official website of Sharda University. Candidates can apply via both Online and Offline mode. Candidates have to fill their personal details in SUAT application form like their full name, mobile number, email ID etc. Step 1: Visit the official website of Sharda University for applying SUAT 2019 exam. Step 2: In the official website there will be Apply Now notification, click on that for applying the exam. Step 3: The Candidates have to choose course name & fill the complete application form. Step 4: Completion of application form filling, a unique ID and password will be generated. This must be kept safely for future use. Step 5: Payment of the SUAT application fee must be done immediately as part of the process. This has to be paid through credit/ debit card/ DD/ Cash deposit at the regional office. Step 6: Once the fee has been received, the candidate will be directed to ATTEST centre. The system will then give an option for slot booking in the online mode. The attestation is the method of checking the authenticity of a document & declaring its authenticity by attaching it with the sign of the verifying personnel. Direct deposit: The cash can be depositing at Sharda University Fee Counter. In a bank: Cash can be deposited at the nearest Punjab National Bank or Axis Bank branch. It is advised to carry a printout of Voucher (Chalan), as a proof of online filling of SUAT 2019 Application Form. Online Mode: The payment should be made via Credit Card/ Debit Card in cases of online submission of the application form. Demand draft: In case of the demand draft, the DD should be drafted in the favour of Sharda University payable at Greater Noida.